There are numerous ways to measure how easy the monetary policy is at any particular time. Quantitative easing aside, one can look at the overnight rates as the simplest measure of stimulus levels. The Fed Funds rate fluctuating between 12 and 25 basis points feels sort of accommodative. Of course a better measure is the real rate, which is the nominal overnight rate less inflation. The lower the real rate the more stimulus is being provided. Unfortunately inflation in the form of CPI releases is a backwards looking indicator. Any monetary policy is meant to set the stage for the next few years and should be more reliant on forward looking indicators of inflation. One such indicator is the inflation rate implied from TIPS. There are clearly issues with both TIPS and the CPI measure itself, but the implied inflation measure gives a decent forward looking indicator implied by the markets. Many economists view low real rates that exist today as restrictive because of tighter credit in the current environment. However the market implied inflation rate already takes into account the current and the expected credit conditions. Therefore the Implied Real Rate is in fact a more holistic indicator of how loose the monetary policy really is as viewed by the markets. 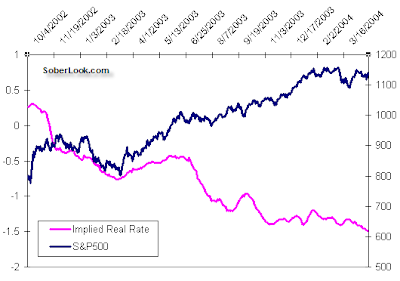 Implied Real Rate = (Fed Funds Effective rate) - (inflation rate implied by the 10-year TIPS). The Implied Real Rate is now at about -2%, the lowest level since TIPS have been first issued. That certainly feels quite accommodative, but let's compare the situation to the last cycle. In particular, let's look at how accommodative policy impacted asset levels - here we use S&P500. 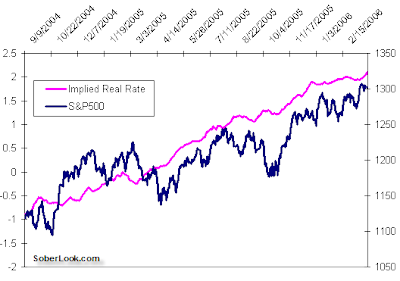 The last big drop in the Implied Real Rate was back in the 2002 - 2004 period, which launched the famous liquidity driven asset bubble. Here is what the measure looks like right now. 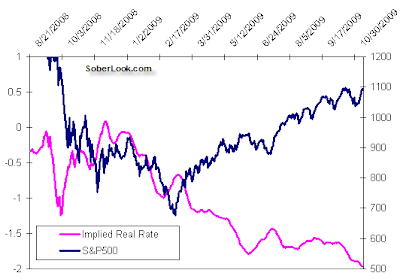 To illustrate that effect, in 2004 the monetary policy did in fact begin to gradually get tighter, as the Implied Real Rate began to rise. But as HSBC points out above, this gradual tightening is (and in fact was) ineffective, and asset prices continued to rise unabated. Mr. Bernanke, maybe it's time for action.